CLICK A DROPDOWN TO REVEAL A DECADE. 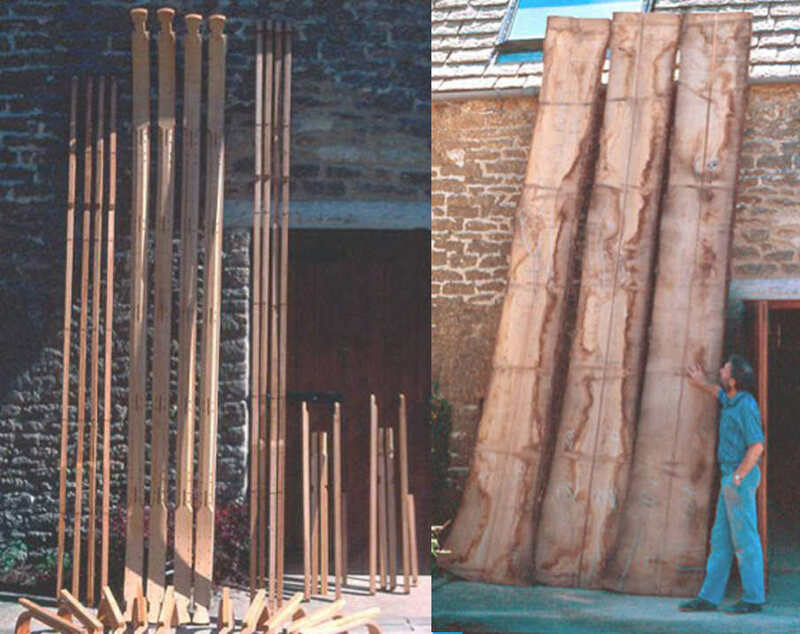 Snowsled’s first order, from British Antarctic Survey, for 2 Nansen sleds and other components, produced, as they still are today, from air dried ash boards (left) at least 13 ft long and 2” thick. ROB SWANN’S INTERNATIONAL NORTH POLE EXPEDITION. 8 Kevlar pulks, specially designed by the expedition. Snowsled made two Nansen sleds for this journey led by Will Steger, of an international team of 6, including Geoff Somers from GB, which completed the longest traverse of the continent (6000 kilometres) in 7 months by dog-sled. A third sled made at the same time is currently in the Malcolm Slessor display at the Fraseburgh Heritage Centre. used during his epic 4-man 16 month long first surface crossing of the Arctic Ocean, by dog-sled, completed in 1969, was renovated by Snowsled, and can be seen in the polar exhibition at the Scott Polar Research Institute in Cambridge. was commisioned by the British Antarctic Survey, to be presented to HM The Queen by the National Environmental Research Council, when she launched the last purpose built research vessel and ice-breaker, the RRS James Clark Ross. The boat is used to re-supply British research bases in Antarctica and to conduct ocean research in the far South. We made a dog racing sled for Keizo Funatsu (who was the Japanese member of TransAntarctica), when he competed in the race that year. The first race, in 2003, to the 1996 position of the North Magnetic Pole, followed the successful televised trek in 1996 organised by David Hempleman Adams and Jock Wishart. It is now run every two years. Snowsled has supplied the plastic pulks and other equipment since it’s inception. The four member team from the Royal Marines, led by Alan Chambers, successfully completed the journey to the North pole. ‘North Pole’ Kevlar pulks from Snowsled. BRITISH ARMY ANTARCTIC PENINSULA EXPEDITION. Snowsled reproduced the Nansen sleds, dog harnesses and traces, and also the manhaul harnesses to the original designs, for this recreation film of Shackleton’s last Antarctic expedition in 1912, starring Kenneth Branner. Snowsled again recreated the Nansen and Amundsen sleds, pyramid tents, manhaul harnesses and other gear for the film portraying the 1912 race to the South Pole by Scott and Amundsen, filmed by Keo Films for Channel Four. Snowsled also made the Nansen sleds for the logistics parties. Fastest solo journey from coastal Antarctica to the South Pole – 690 miles in just over 39 days. Snowsled supplied her ‘Ice-cap 200 pulk’. A 5-member British expedition, recreating Scott’s 1912 journey to the South Pole. Snowsled organised all the equipment and clothing and manufactured most of it, to the original 1912 specification. Stefano Miglietti from Italy, won the Yukon Ultra 300 mile race in Whitehorse, Canada, using a Snowsled Ice Blue plastic sled. Using kites and Snowsled ‘Ice Blue’ plastic pulks. The small French party of three led by Michael Charavin completed the journey in 31 days. Snowsled was commissioned to make a large komatik sled (4.5 m long X 2.2 m wide), to support a small ’magnetics’ hut during their 2200 Kms traverse in Antarctica. Chris Todd from the UK, won the 6633 Arctic Ultra 350 mile race in Yukon, Canada, using a Snowsled Ice Blue plastic sled and wheel system. These wheeled pulks have become a standard piece of equipment for this race ever since. Felicity Aston and seven other women companions from the Commonwealth, reached the South Pole after hauling pulks (Ice Blue Snowsled pulks) 900 miles from the coast of Antarctica. AMELIA RUSSELL AND DAN DARLEY. reached the North Pole using Snowsled North Pole 160 pulks. Amelia was the first British Woman and the couple were the 5th and 6th Brits to successfully trek unsupported. Michael Charavin and Cornelius Strohm completed a circumnavigation of Greenland using Ice Blue Expedition pulks and kites in 59 days (average 86 Kms/day), travelling 5067 Kms. – the longest ski-kite journey ever.